One lady you need to check out is Dottyral. She has everything set up so nice, from her photos, shop, blog...! She is one of my contacts on flickr Dottyral. I really enjoy looking at her photos & reading their descriptions. First off, the pictures are taken very well--bright & clear. I like the customer appreciation set, it's nice to see what customers do with your items & vice verse. She is a very talented crafter--she does crocheting, pin cushions, buttons, jewelry, accessories & so many other things. Check out her photos, you'll see what I mean. I just bought a ring pin cushion made with a really pretty "black & white ironwork" pattern, can't wait till it comes! You also need to check out Dottyral's Blog. She features other great etsy shops & updates about her shop. One of the reasons I love etsy so much is its community. I love that etsians help each other out instead of competing with each other, and you will find this love at Dotty's blog. 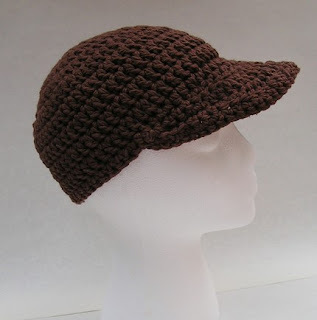 I know the next thing I plan to buy from her is this crocheted hat, one of my favorite colors too! The holidays are coming so check outDottyral's etsy shop! She has so many different things & great prices, you'll find something for someone! Update: I received my pin cushion ring & it is awesome! I use the really long pins & the ring has metal at the base which prevents the pins from going thru. This ring is very well made & is super cute! I love it! Thanks Dotty! Jen, thanks so much for the feature and the kind words!! Your blog is terrific!